Remember these poor bees, reduced to hanging round a Soho lamp post earlier this year? Shocking. Spare a fiver of your hard-earneds and you could help house a bee in its very own Brutalist high rise. We jest, of course, but we need bees and the good and greenfingered people at Lambeth's Roots and Shoots have launched a seasonal sponsorship campaign to raise money towards protecting them and creating different habitats for rare species at their Lambeth home. Maybe they could build a bee Strata next? Watch this sweet animation and bee persuaded to help the Hymenopterans this Christmas. 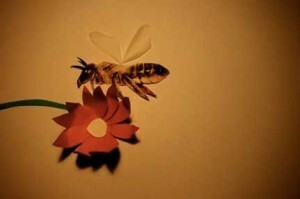 Bee Amazed at Roots and Shoots from georgina dunn on Vimeo.